By 1944 the better part of the German Army had been consumed in Russia. 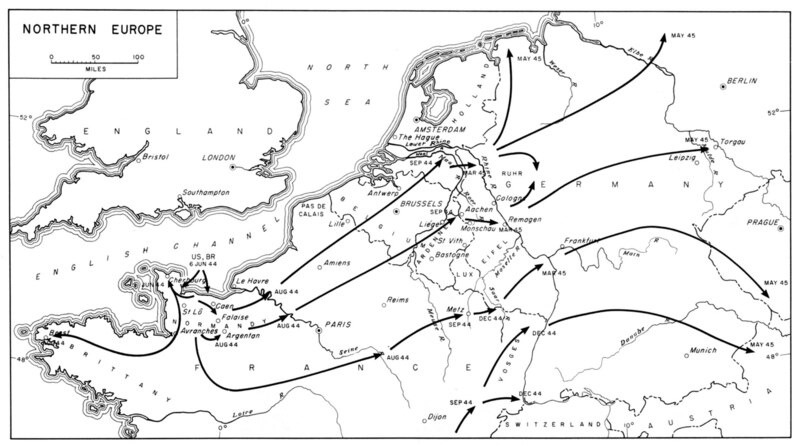 Defending western Europe required the Germans to be spread across continent, defending the coast from southern France to Norway. German strategy was to defend the coastline long enough to counterattack with mobile reserves before the invaders had a chance to consolidate. Just as the Allies had learned from their experiences in Sicily and Italy, the Germans had also learned some valuable lessons. The overwhelming weight of firepower that the Alllied fleet could bring down to protect their beacheads was a lesson learned well. The coastal defences were manned with second rate troops, often marginal units of Eastern European volunteers. The plan was to delay the invaders long enough on the coasr until mobile reserves could be brought up to push them back into the sea. The German Infantryman in 1944 was still the backbone of the Wehrmacht.The "Landser" was formidable in the attack and lethal in defence. As the war progressed, German technology provided the basic Infantryman with ever increasing levels of firepower. From the Panzerfaust antitank rocket to the MG 42 machinegun, the German Infantryman of 1944 was capable of bringing great firepower to the battlefield. The Russian Front consumed more manpower with each passing day and the Germans demonstrated a remarkable ability at rebuilding units after extensive combat losses. Western Europe provided a good environment for rebuilding and refitting units after the brutal battles on the Eastern Front. It was unfortunate for the Americans landing at Omaha Beach that they encountered one of those rebuilding German Infantry Divisions when they landed. Even at the late stage of the war the regular German soldier was still a formidible foe and at Omaha showed how lethal they still were. The Americans butted up against the 6th Regiment of the 2nd Falshirmjaeger Division in Normandy and soon learned that the German paratrooper still earned the respect of his enemies. Tenacious, well equipped and well led the German paratroopers fought with distinction in all theaters until the end of the war. The paratrooper on display is armed with the 88mm "Panzerschreck" rocket launcher deadly in the figting in the bocage of Normandy. The backbone of the German defensive plan was the same that had gotten them there, their Armored (Panzer) units. German strategy depended on a rapid response by their armored units to any landing. The Panzers represented the most lethal force the Germans could deploy on the battlefield. German tanks, particularly the Mark V Panther and Tiger series, were far superior to the Allied tanks at that time and the Germans were confident they could win that part of the coming battle to defeat the invaders.. The Waffen SS had grown from a small police force to an army unto itself. While the intiial standards of racial purity were lessened as thewar went on, the Waffen SS remained a force of volunteers. By 1944 foreigners far out numbered native Germans in the SS. The Waffen SS had become the closest the world has ever seen to a European army. The majority of the Waffen SS were committed to the Easten Front and the German sused Western Europe as a place to rest and refit units from the brutal fighting in the East. When the Allies landed several Waffen SS Divisions were already in France refitting. The closest was the 12th SS "Hitler Jugend" which was first established within striking distance of the coast. The 12th SS was instrumental in blocking the British attempts at taking Caen and other SS units, most notably the 1st and 2nd SS Panzer Divisions, arrivied after the invasion.